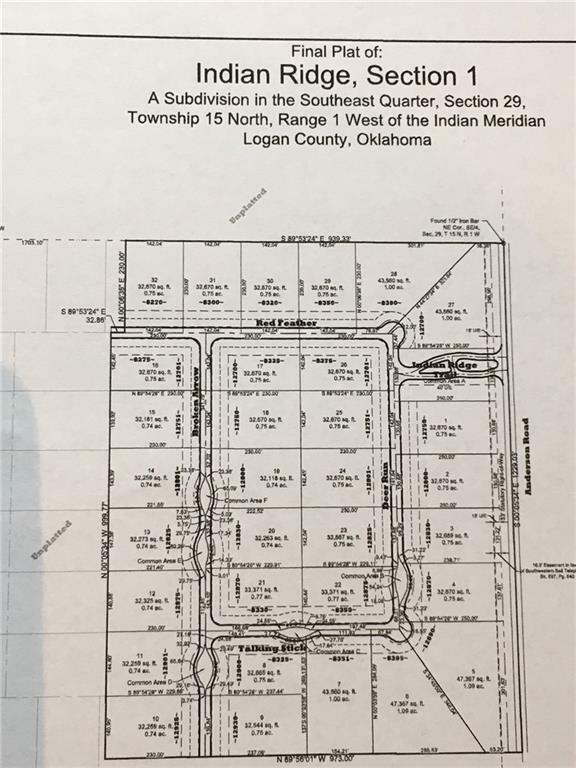 HEAVILY WOODED ACREAGE SUBDIVISION IN THE EDMOND SCHOOL DISTRICT.LOTS RANGE IN SIZE FROM .74 UP TO 1.09. GATED ENTRY WITH VIDEO SECURITY.CONCRETE STREETS & CURBS.STREET LIGHTING THRU OUT THE SUBDIVISION.DEVELOPER HAS TO APPROVE BOTH BUILDER AND ELEVATION/FLOOR PLAN.CENTRAL ELECTRIC COOP, LOGAN CO. RURAL WATER.LISTING BROKER IS RELATED TO SELLER.FUTURE PLAN TO REPAVE SIMMONS RD UP TO ENTRANCE OF INDIAN RIDGE. Offered by Phyllis Meinders of Filly's Real Estate Company. Listing provided courtesy of Phyllis Meinders of Filly's Real Estate Company.